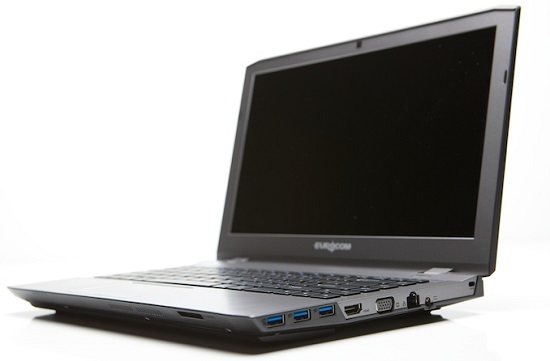 Eurocom is launching the M4, the world’s most powerful 13.3” QHD+ notebook. It is equipped with a breathtaking 3200x1800 QHD+ display, an Intel Core i7 Extreme Processor and NVIDIA GeForce GTX 860M Maxwell graphics. The 5,760,000 pixels of the 13.3” 3200x1800 QHD+ display are powered by the NVIDIA GeForce GTX 860M graphics with 2GB DDR5 VRAM, 640 CUDA Cores, with a GPU core able to run at up to 1029MHz +boost. Weighing just two kilograms and being only 1.2 inches thin makes the EUROCOM M4 extremely easy to carry and transport, with no need for a power cord due to the great battery life brought on by supported NVIDIA Optimus Technology. Gaming is all about refresh rates and great visuals, the M4 does not disappoint with a beautiful 13.3” 3200x1800 QHD+ display powered by powerful NVIDIA GeForce GTX 860M graphics. Audio is enhanced thanks to the Sound Blaster Cinema audio platform featuring SBX Pro Studio. Powered by a full line of 4th Generation Intel Core i7 processors utilizing the Intel HM87 Express Chipset including the Intel Core i7-4940MX Processor Extreme with 4 cores and 8 threads running at 3.1 GHz (up to 4 GHz max turbo frequency) with 8 MB L3 cache. A menacing silver Backlit keyboard makes gaming or working in the dark a breeze. Up to 16 GB DDR3-1866 SODIMM memory is supported via two slots with 8 GB modules that are easy to access to upgrade or replace. The M4 is fully configurable and upgradable, prices start at $935 usd and due to the high performance nature of the M4 it can be configured with an Intel Core i7-4940MX processor, 16 GB DDR3-1866 memory, two 1 TB Samsung 840 EVO mSATA SSD’s, an 800 GB Intel DC S3700 SSD and Intel Dual Band Wireless-AC 7260 for $5847. Users will be able to carry the M4 to battle with all the SATA 3 (6 Gb/s) data they need, with two mSATA SSD storage devices and one standard storage drive for a total of 3.5 TB of storage with RAID capability. The M4 offers the ultimate in SATA 3 storage performance and redundancy. Customers have the option to configure the M4 with consumer grade drives all the way to enterprise class drives with the best in performance, redundancy and reliability with the added benefit of easily being able to add or change storage drives. To improve your gaming and listening experience the M4 comes equipped with a Sound Blaster Cinema audio platform featuring SBX audio and on board audio amplifier to boost power to your speakers for maximum sounds quality. In addition to its performance prowess the EUROCOM M4 is also loaded with a series of security features to keep you data and personal information safe. The integrate Trusted Platform Module 1.2 from Infineon Technologies ensures that digital certificates, passwords and keys are made more secure from software attacks and physical theft. TPM provides the ability for a computing system to run applications more secure and allows secured remote access to perform electronic transactions and communication more safely. The increased security, brought on by the TPM 1.2 can save organizations in IT management costs. A Kensington lock port allows users to physically lock down the M4 to prevent theft.